That Weird Popcorn Step: Is it a Stitch? Lots of new items in the shop this week, and coupon news! See the right column for more. 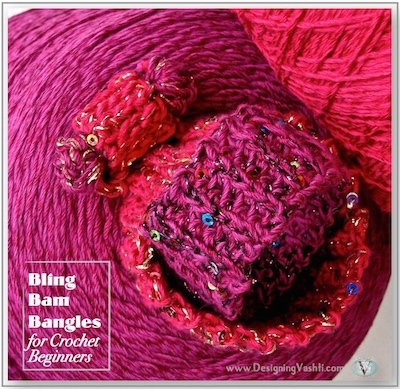 This issue #67 is about a simple, useful thing that some crocheters do, creatively. It baffles other crocheters. It baffles me how to capture it in photos, because its superpower is Invisibility. The first step is to take your hook out of the loop after completing a stitch. Other than for popcorn stitches, we rarely do this in crochet! This loop is called the "live loop" because it would start unraveling if you pull on the yarn. The second step is to insert the hook in a different stitch. (You can do this in any loop of any stitch; it depends on the project.) Then, catch the live loop with the hook and draw it through the stitch. You have done this if you've ever crocheted a true popcorn stitch. Possibly also as an invisible way to join a round, or for "downward picots" and other cool Victorian crochet moves. 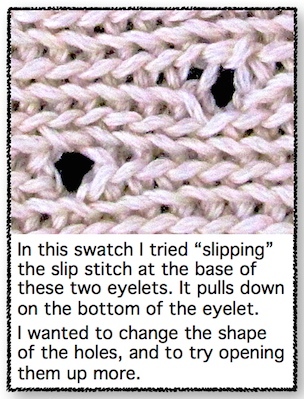 I think of it as a "slipped slip stitch." See below for why. Doris showed me this image at left of a motif edge she joined to a solid panel, invisibly. Take the hook out of the live loop. Unsettling! Insert that untethered hook in a different stitch. From front to back, or back to front, up from the bottom, or down through the top of a stitch. Before or after the stitch you just completed, or above or below it. Or, in a different place of the same stitch. Weird! Use the hook to pull the live loop through the place where you put the hook. No yarn over needed. Wait. What? It needs a name. Sometimes it's called an "Invisible Join" or a "Flat Join", but so are other things. It also does more than join, just like a slip stitch [sl st] does more than join. It can change the look and angle of a stitch, and where a new stitch begins. It might be useful for sculpting eyelets and smoothing some shaping methods. A name would unify the range of important things it does. 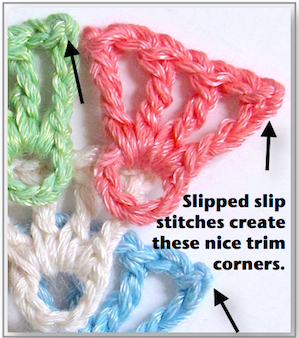 I've been thinking of it as a "slipped slip stitch" for the past few years. In a sl st crochet project, a sl st join is bulky, whereas slipping the sl st adds no height or bulk. When I needed to conserve yarn amounts for the Lotus Chips charms, it came in handy: a slipped sl st uses no yarn to complete picots or to join rounds. There is a hint of historical precedence for this name. In Marie Louise Keizman's 1883 Twine Crochet Work, she explains how to crochet basic stitches, such as a Slip Stitch: "Take the hook from the last loop worked, pass it through the loop where the work has to be joined; then take the first loop spoken of and draw it through." The sl st as we make it today was a "Close Chain Stitch" in her book. Got a coupon? It expires Feb. 15, not Feb.1. New products! (below). 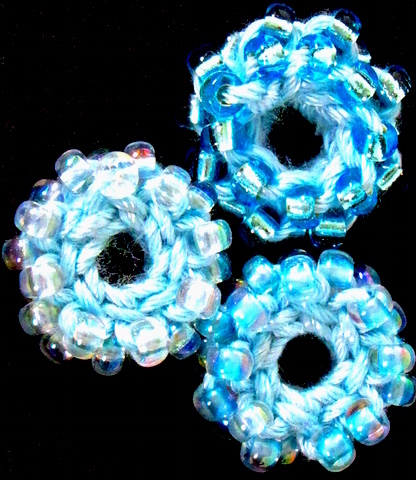 "Slipping" the slip stitch join creates the clean, even center holes of these Candied Pony Beads. Three new items added to the shop! Always FREE shipping to USA addresses. 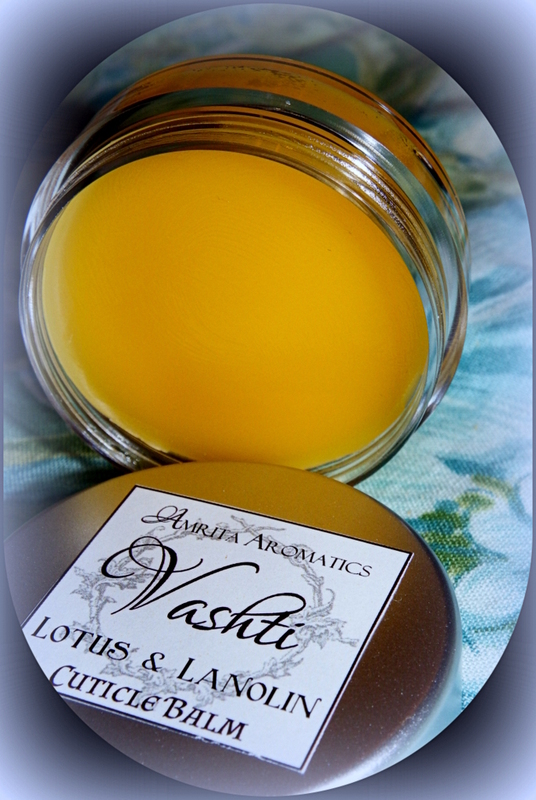 Limited Edition Lotus & Lanolin Cuticle Balm. I collaborated with my dear friend Ananda Wilson, who specializes in natural fragrance blends and aromatherapy. 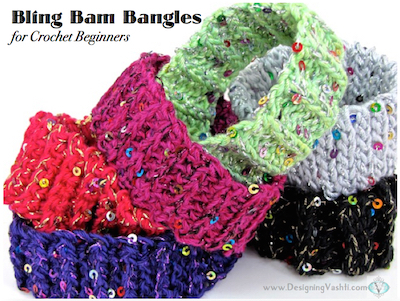 Bling Bam Bangles: A Beginner-Friendly Crochet Pattern. Choose from four introductory ribbings, and an optional mock clasp. I "blinged up" a strand of Lotus yarn by crocheting it together with a metallic sequined thread. 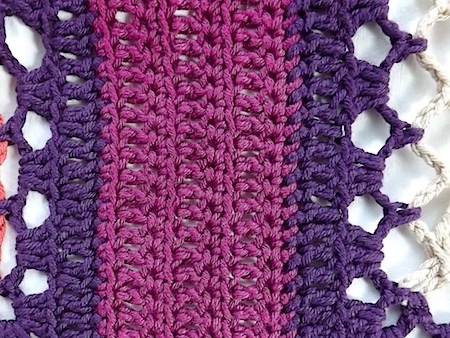 This simple, satisfying pattern would work with plenty of other kinds of yarn too. 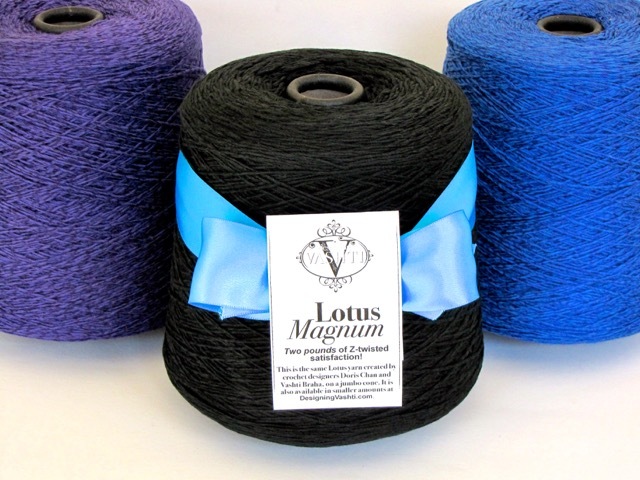 The Lotus Magnum is a two-pound cone of Lotus yarn! That's approx. 2,300 yds! (Just under a kilo.) I have it in ten colors (scroll to bottom, choose color from drop-down menu). Doris designed the Harmony Bamboo Tank pattern in the Spring 2015 Crochet! Magazine. It came out great in the Lotus yarn, didn't it? Doris' year as Crochet Designer in Residence at WEBS has begun! Read more about it at her blog. Designer Jennifer Ryan used Lotus yarn for her lovely Fabric Fusion Tote in the Spring 2015 issue of Crochet! Magazine. The design is also paired with an article in the magazine's "Learn it, Do it" section. Jennifer wrote, "I crocheted the handles with the new Lotus Yarn by Designing Vashti - it has a beautiful sheen seen best in the bright sunlight and comes in great colors." Forward this email to a friend! -:---:- Subscribe to this free newsletter. Update your profile or Unsubscribe <<Email Address>> from this list. Vashti Braha is a professional crochet designer & teacher who resides in Florida (USA) and owns www.DesigningVashti.com. Copyright (C) 2015 DesigningVashti Crochet All rights reserved.